I grew up eating gingerbread men, women, pigs, cats, dogs for Christmas. The rest of the year I got by on gingersnaps. 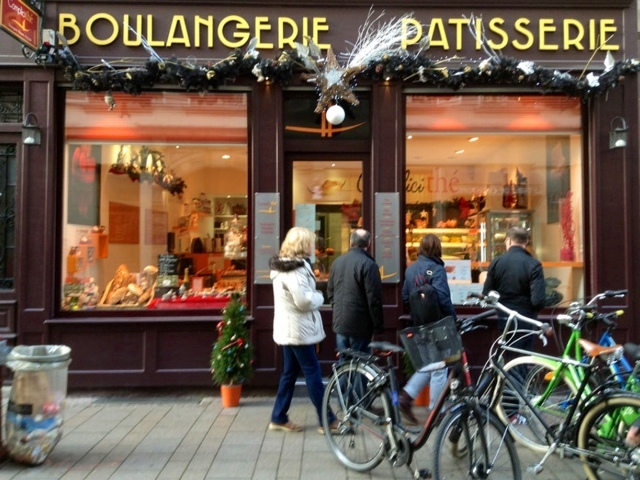 Naturally you would think Strasbourg in Alsace would be loaded with gingerbread. Sadly you would be very wrong. 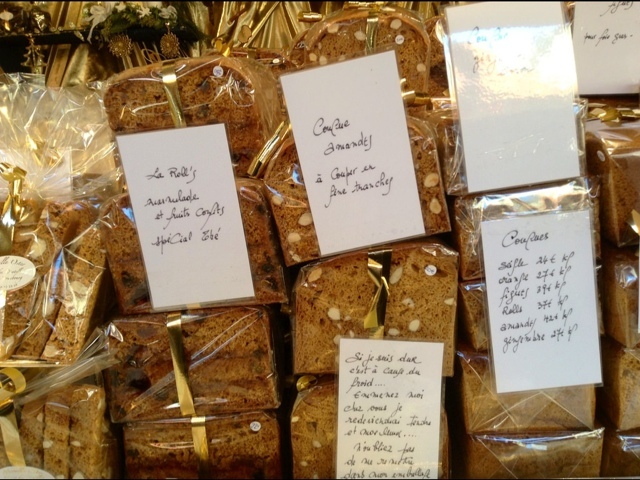 Strasbourgundians (I made that word up) are overly fond of anything pain d'epice - a kind of honey spice bread and very soft to boot. Filled to the brim with kuglehopf and other local specialties. And I do mean filled. 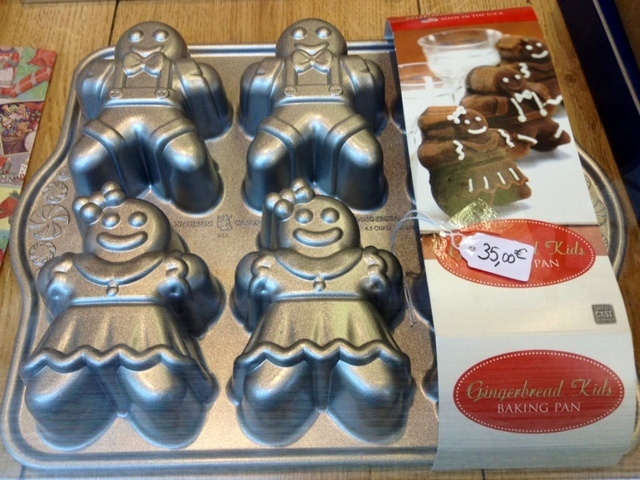 Certainly they have the right cookie cutters to make a decent gingerbread man or dog. 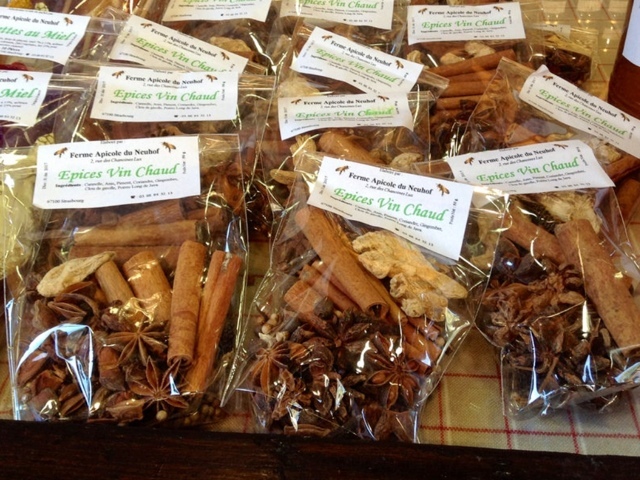 They have the essential spices too, but they choose to put them into their steaming pots of mulled wine only. Why is this? 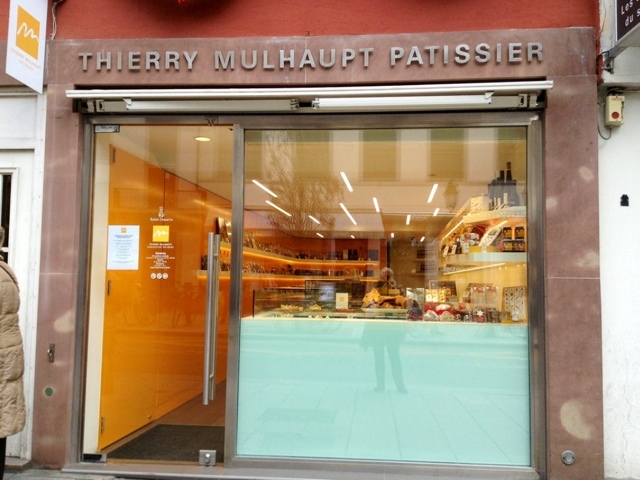 Should I move to Strasbourg and open my own gingerbread shop? Pain d'epice usually comes in giant loaves. 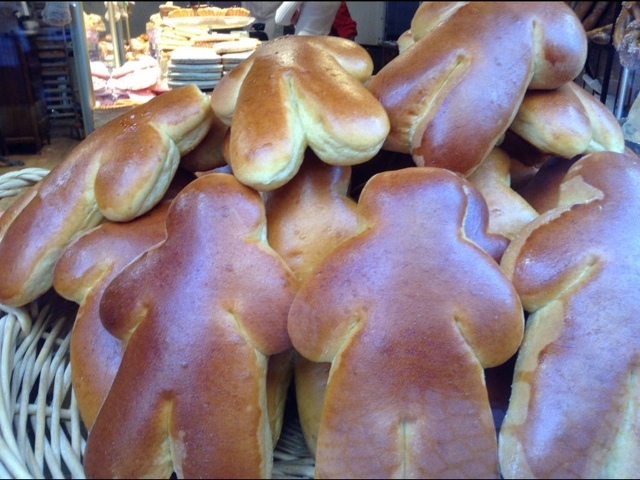 Franchement I think it a bit unfair to deceive innocents like myself making pain d'epice into santa men shapes. Don't you? 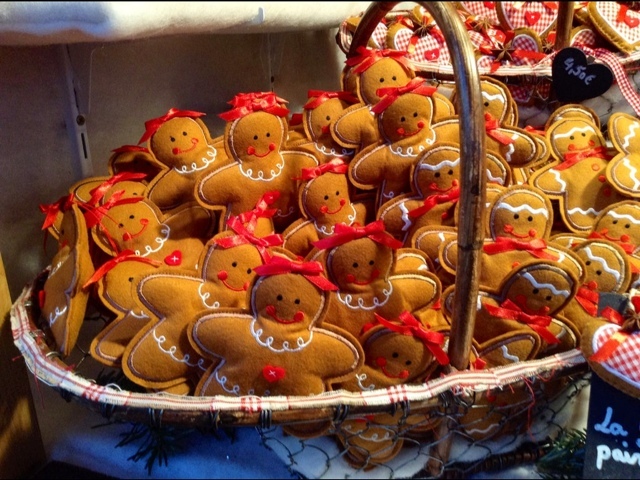 Should eat gingerbread! There oughtta be a law. 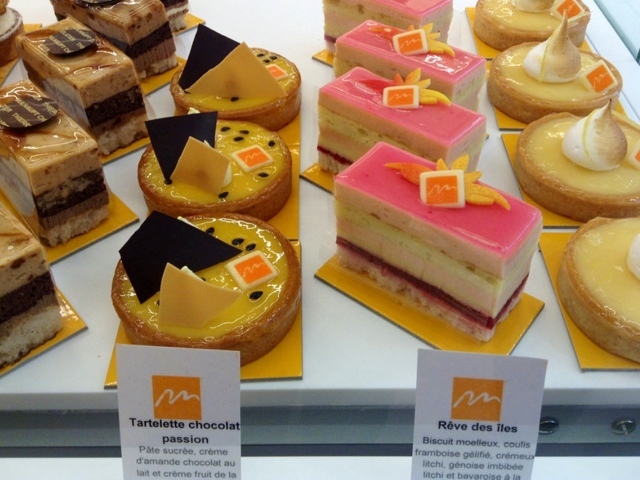 I was drawn to his beautiful passion fruit and citron tartes, but no gingerbread. 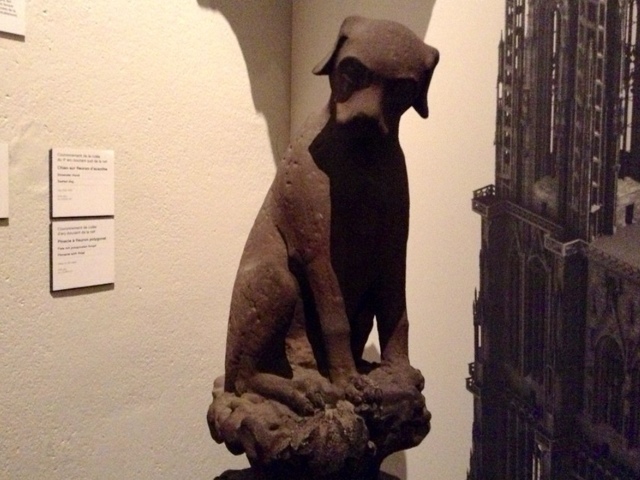 This rather downcast medieval doggie looks like he didn't get his gingersnap. I mean do these soft, puffy cakes look tasty to you? Be honest. Where's the crunch? Where's the snap? 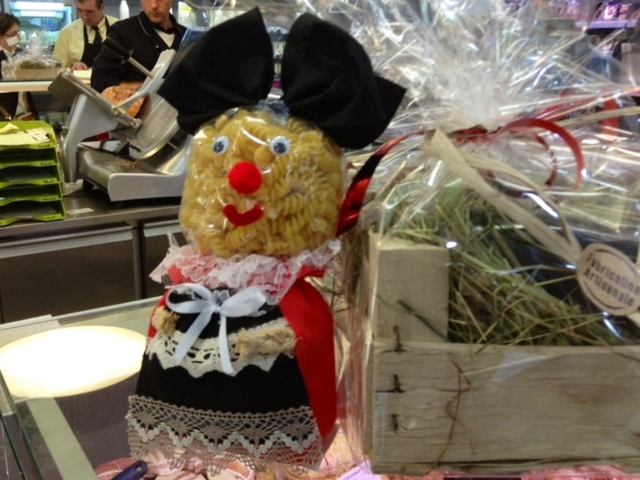 OK. Clearly this is a Noodle lady in traditional dress. No one is fooled here. 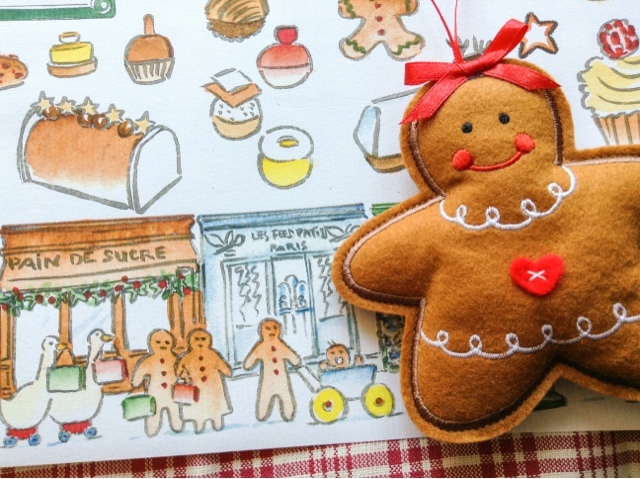 Perhaps the December Paris map is a subliminal homage to the missing gingerbread in my life.. 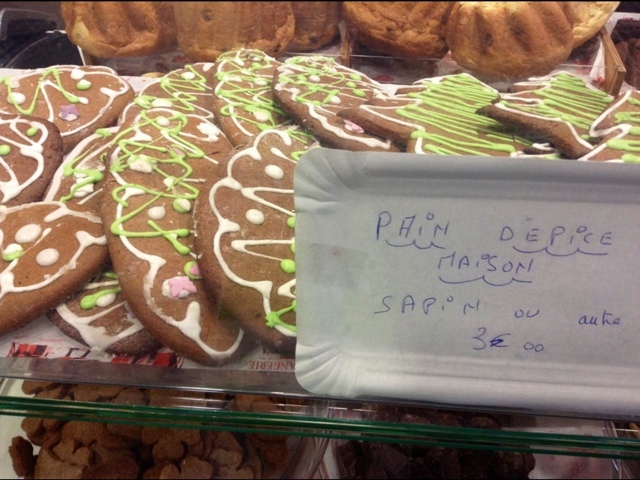 I did hear recently of an American making real gingerbread cookies in the 3rd. I will investigate further and report back Parisbreakfast fans. I hear you about the crispy gingerbread of childhood and the Nabisco snaps. 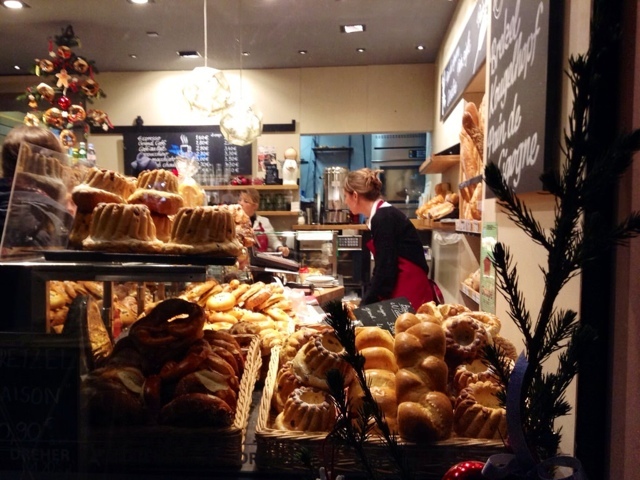 Could it be that you need to travel to Sweden for the crispy variety? Your pouty frustration brings out the best in your writing ... Gave me a good morning coffee laugh! I did go to the Swedish Christmas fete at the church. The little felt one is very cute..
Bonjour Tristesse..1958:)My husband picked one of our daughter's names..from Mylène Demongeot. Thank you Carol for the joy you bring to the world. Joy to your world and happy holidays! Oh my, I feel like I steered you wrong (to Strasbourg!). 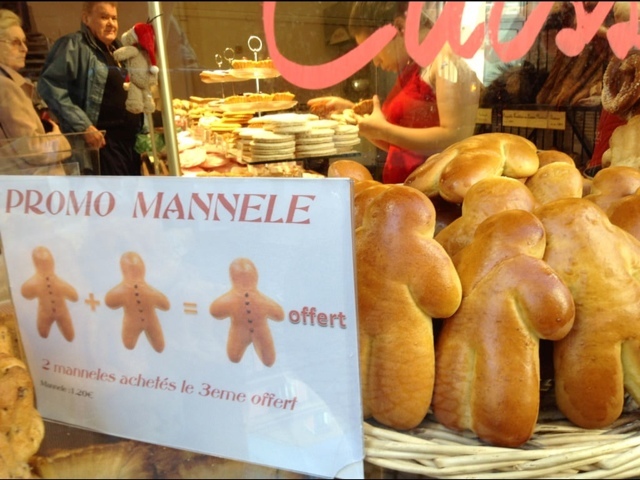 Saw many small decorated "gingerbread" boys hanging from stalls in front of the Cathedrale - who knew they were pain d'epice! All the vin chaud I drank must have clouded my judgement! 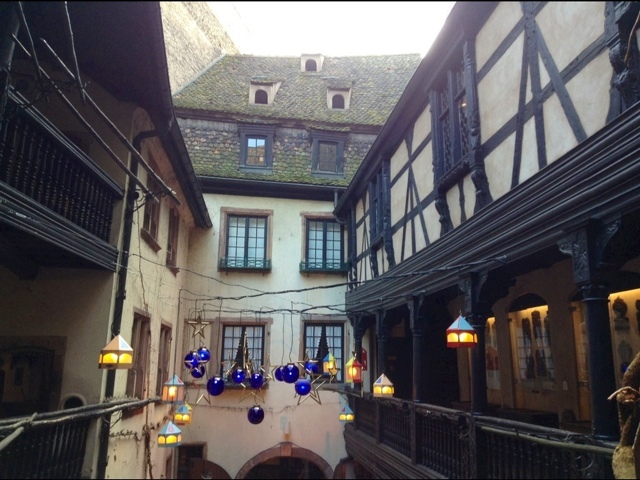 Love seeing Strasbourg through your artist's eyes! It is a beautiful place; I need to go back in the summertime for a different perspective. Bonnes fêtes, Carol! 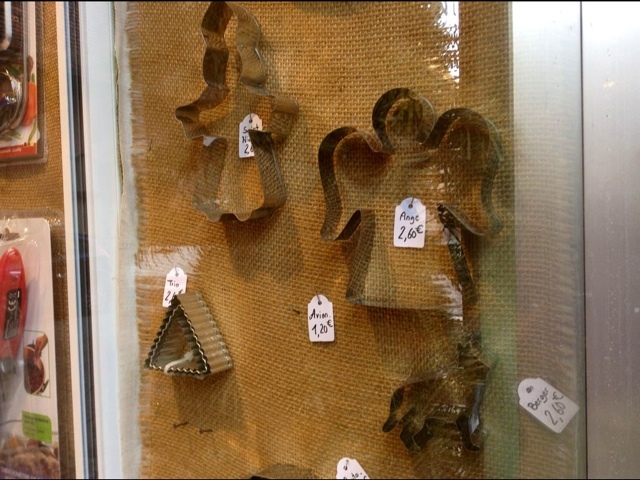 I bet those were tree ornaments. Strasbourg is tree ornament center of the world. yes the raisin buttons...much better than a load of colored icing. 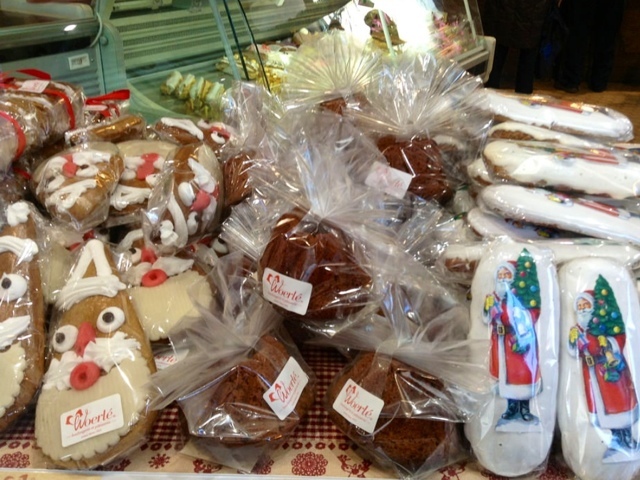 I am a lover of the pain d'epice,but when we want a gingerbread cookie we want a gingerbread cookie. Good luck in Paris with your search. Keep warm and have a beautiful holiday season. Sometimes gingersnaps will have to do. 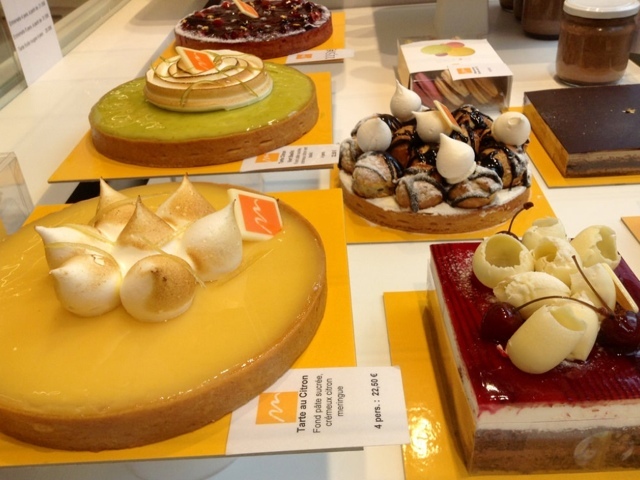 Love the lemon tarts - good anytime of the year. Merry, Merry Christmas, Carol, and may your New Year be spectacular. if only they had Keebler's GINGERSNAPS here!!! 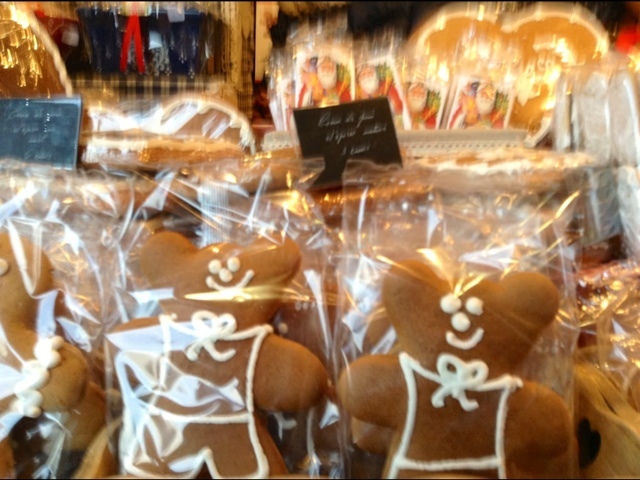 Here's hoping you find the perfect gingerbread man for Christmas!! Bear didn't get to go to Strasburg? I'm with you Carol. Need the crunch and snap. Don't like soft cookies. 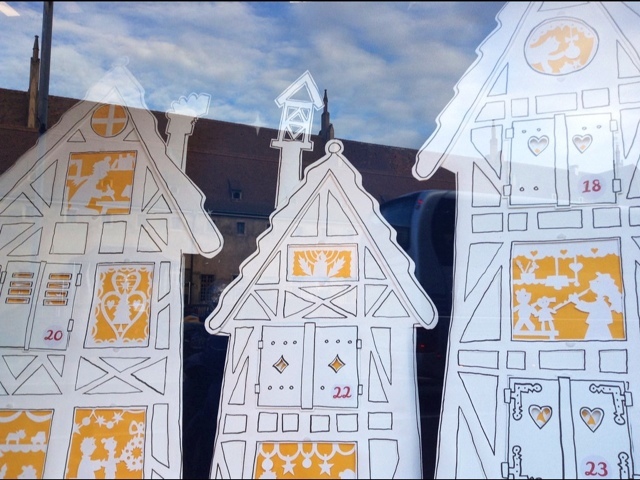 Loved Strasburg and Colmar!! THANK YOU.....ABSOLUTELY MAGICAL. 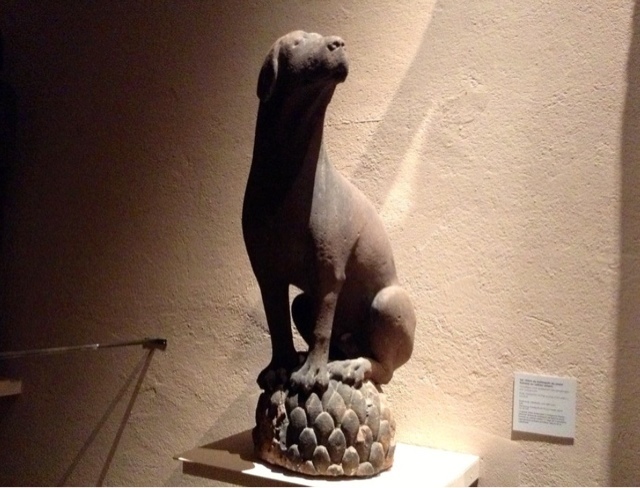 Your photos are lovely, and I'm so glad you shared so many with us. Love the Strasbourg post. Love love. But I am untrustworthy around gingerbread raw dough. Just want you to know that I love what you do. Yes for MORE Strasbourg, Carol! Your December blogs have been like receiving special Christmas gifts each time. Hope you are able to enjoy some of the pleasure you're giving others! The pain d'epice simply bewilders me. But gingerbread us a whole different story! I have been hoarding gingerbread recipes for a taste-off. Perhaps this is the year to bake them? I'm so very behind on reading things but I want to wish you the Merriest of Christmasses and a wonderful new year! I look forward to calming down and reading all I've missed -- and oh, the fun of the new year!